By Pedro Pereira, Business Solutions magazine. An integrator’s quick service restaurant (QSR) POS solution leads to add-on sales and a long-term customer. After seeing one of Amber Systems Technologies’ Vigore point of sale (POS) systems in action, a fastexpanding company that already owns more than 30 fast-food franchises on the East Coast decided to give the integrator a call. Would Amber Systems install a similar system in the customer’s growing chain of restaurants? The answer, of course, was yes. The customer, says Amber President Naveen Kumar, was impressed by how quickly restaurant cashiers could complete a customer’s order. Depending on the POS system in use, an order at a fast-food restaurant can take several minutes as the user pushes various touch screen buttons and prints out a receipt and order ticket. The Vigore system shortens the process to less than a minute, Kumar says. Two months after initial contact with the customer in February 2012, Amber signed a contract to customize a Linuxbased Vigore POS solution to the franchise company’s specifications. The contract called for an initial deployment in 10 locations at a cost of $30,000, to be followed up later with further installations. The customized Vigore system would be designed to run on Poindus VariPOS 715 units. 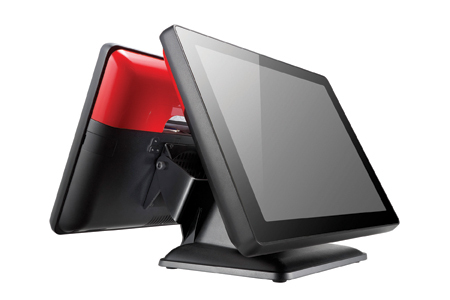 The VariPOS all-in-one units have integrated touch screens and cash drawers and come in various colors. Kumar says customers like how the colors pop, adding to the aesthetics of their establishments. In addition to looks, the VariPOS units offer the right combination of usability and durability, says Kumar. The Poindus hardware sports die-cast aluminum casings with rugged bases. The units are also spill-proof and require the “least amount of wiring” compared to competitive products, Kumar says. For this project, custom buttons were needed to process coupons, add upcharge options, and calculate adjusted prices on the fly so order takers can charge patrons accurately and quickly and then move on to the next customer. By making buttons for these functions prominent on the screen, a cashier quickly moves through the screen menus to complete a sale. Other POS systems, Kumar says, have cluttered screens that confuse users and bog down the order-taking process. Kumar says the customer is pleased with the initial 10-location rollout and has contracted Amber to deploy the Vigore/Poindus solution in another 10 locations this year, at an estimated price tag of $30,000. Because of the intuitive interface of the Vigore/ Poindus solution, the customer is collecting as much as an extra $300 per month. That’s because the system has eliminated errors in calculating upcharges and coupons that were common with a previous POS system. In addition, the Vigore system links to backend applications such as inventory tracking. By keeping better track of items sold and reducing inventory waste, the customer has realized monthly savings of at least $1,000, according to Kumar. As a result of these savings, the customer achieved a one-month payback on the new POS system. The positive results, says Kumar, are helping Amber win business with new customers.